Fashion Feline to the rescue! How much time have you got before the wedding, Nicole? If you've never worn high heels before, you'll need some practice. If the highest heel you've ever worn is 1 inch, start by trying an inch and a half. Move up incrementally from there. The most comfortable heels are boots and mary janes since your foot stays put--luckily many dyeable wedding shoes are mary janes! Even though some of the most glamorous kitties (Cat Woman) wear spikes, stacked heels are much easier to wear. It also helps to have your toe to the ground, not on a platform, so you have a bit more control. 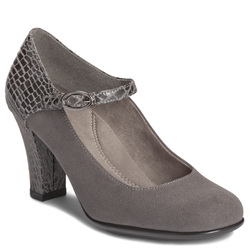 Hopefully your sister will choose a stacked-heel mary jane! -->^..^< Meow and good luck!